A calzone is a folded pizza, stuffed with meat and cheese and baked. Not to be confused with a stromboli, calzones are popular in certain Italian-themed restaurants as well as many larger-inventory grocers. Aldi sells calzones as well. 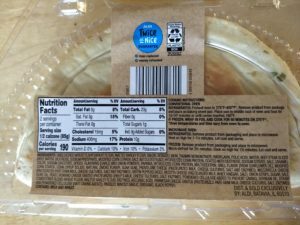 As best as we can tell, some of the calzones are full-time Regular Buys while others are ALDI Finds (Special Buys) that are only in stores occasionally. We’re not sure if there are differences in availability depending on region. 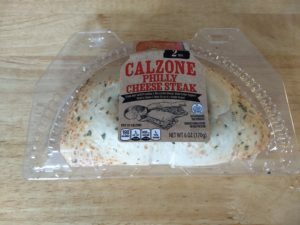 What we can tell you is that, in our area, the Philly Cheese Steak Calzone we’re talking about here is an ALDI Find. A Mama Cozzi’s calzone comes in a calzone-shaped plastic clamshell package in the store’s frozen section. It contains one calzone, with instructions and nutrition on the back. There are two ways to prepare the calzone, with variations on each depending on whether your calzone is frozen or refrigerated. Keep in mind that the refrigerated instructions are faster, so if you know you’ll be eating it in the near future, move it to the fridge so it can thaw. The first cooking method is the oven. If the calzone is refrigerated, the instructions say you are to preheat the oven to 375-400 degrees. (Why the temperature isn’t specific, we don’t know.) From there, remove the product from the package, place it on a baking sheet in the middle rack, and bake for 10-14 minutes or until the center reaches 160 degrees. If your calzone is frozen, baking requires wrapping the calzone in foil and baking at 375 degrees for 60 minutes. The second cooking method is a microwave. If the calzone is refrigerated, heating it up requires microwaving on high for 1 to 1 1/2 minutes, then letting it cool before serving. If the calzone is frozen, you first need to defrost it in the microwave for 3 1/2 minutes, then cook on high for 1 1/2 minutes before letting cool. Because of time constraints, we microwaved the calzone, although we had been able to defrost it in the refrigerator ahead of time. In our case, we needed the full 1 1/2 minutes (and maybe a bit more) to heat it through from refrigerated. Taste-wise, it’s okay. We’ve never found frozen processed pastries to be particularly special, and this one is no exception. The components for a good calzone are all there, but the flavors aren’t as rich as something you’d get from a restaurant or cafe. Nutritionally, this has two hallmarks of processed food: high sodium and an insanely long ingredients list. The calories and fat don’t look too bad … until you realize this is supposed to be two servings, at which point it looms a little larger. 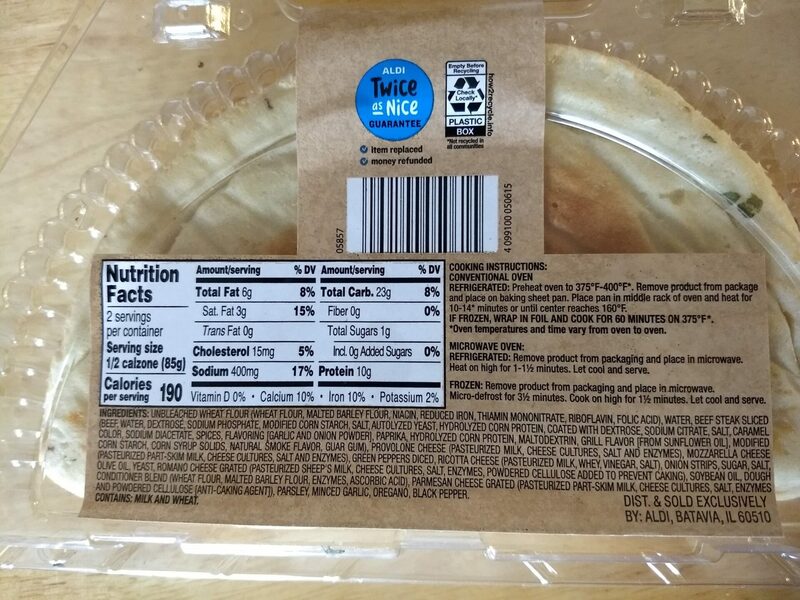 The whole calzone contains 380 calories, 12 grams of fat, and 800 mg of sodium. The sodium content, by the way, makes up about 1/3 of your recommended daily allowance. It’s better than a Hot Pocket, but it’s also still a processed pastry, which means the Mama Cozzi’s Philly Cheese Steak Calzone is decent but not great. If you need a quick entree, this isn’t a bad option, but it’s no substitute for the real thing from a restaurant. It’s also not the healthiest thing, either. I tried the Mama Cozzi’s Philly Cheese Steak Calzone and ending up returning it. My second bite had a nasty “alien” piece of gristle and the rest was mostly dough with not enough filling. It made me long for a good Philly cheesesteak,which I had the next day. Aldi did honor the “twice as nice” guarantee,which I got the cheese calzone which I haven’t tried yet.